Found 6 file extension associations related to H2OMAP Water and 2 file formats developed specifically for use with H2OMAP Water. Developer / company: MWH Soft, Inc. Built using advanced Object-Oriented Geospatial Component model, H2OMAP Water provides the most powerful and practical GIS platform for water utility solutions. As a stand-alone GIS-based program, H2OMAP Water combines spatial analysis tools and mapping functions with sophisticated and accurate network modeling for complete infrastructure (asset) management and business planning. It performs fast, reliable and comprehensive hydraulic and dynamic water quality modeling, energy management (with true variable speed pumping), real-time simulation and control with on-line SCADA interface, complete fire flow analysis, and unidirectional flushing. 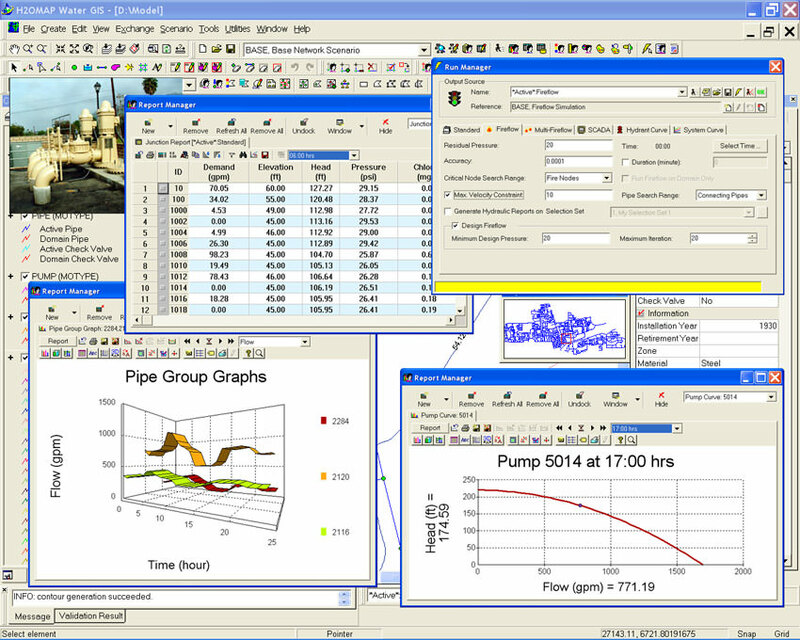 The program can also be effectively used to analyze pressurized sewer collection system. If you need more information please contact the developers of H2OMAP Water (MWH Soft, Inc.), or check out their product website.